Karl Kristian Schneider (1865-1911) created this artwork. It consists of ten terra cotta panels, which are approximately 3' x 9'6". 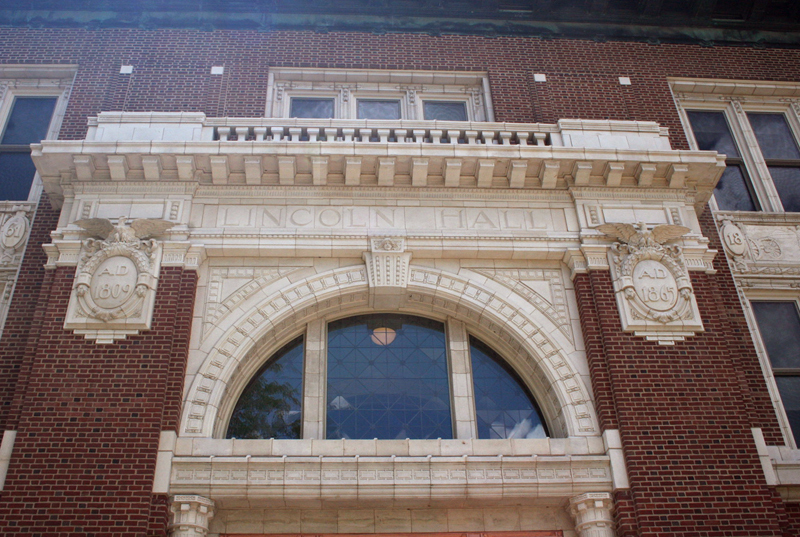 They are displayed in the east facade of Lincoln Hall. To memorialize "the first citizen of this state to be elected President of the United States, the signer of the bill which made the state university possible, and the consistent and persevering friend of higher education and the nation," the lllinois state legislature in 1909, the hundredth anniversary of Abraham Lincoln's birth, appropriated $250,000 to erect Lincoln Hall. Among the building's exterior decorations, above the second-floor windows, are quotations from Lincoln's speeches and writings and medallion portraits of men closely associated with him in his work. But placed in the most important position, at either side of the main entrance at the same height, is still another architectural feature-a series of ten white terra-cotta panels depicting scenes from Lincoln's life, from his early years as a rail splitter to the close of the Civil War, each set off with a date to clarify the subject matter. From left to right, they are entitled Lincoln as a Rail Splitter, 1830; Lincoln as a River Boatman, 1831; Lincoln as the Circuit Rider, 1849; Lincoln-Douglas Debate, 1858; Lincoln's First Inaugural Address, 1861; "We are Coming, Father Abraham, One Hundred Thousand Strong," 1861; Abraham Lincoln, the Savior of the Slaves, 1863; Battlefield of Gettysburg, 1863; Surrender at Appomattox Courthouse, 1865; and The Soldier's Return, 1865. Karl Schneider, chief of the artistic staff of the American Terra Cotta and Ceramic Company, Chicago, designed the pieces, spending nearly a year on the project. He complained about his laborious research, noting that biographers did not sufficiently cover dramatic events or inspire him, that he had to visit historical sites and communicate with Lincoln's descendants and others to learn anecdotes and gather pictures himself. Even in April 1911, questions about their artistic value were raised when an informal committee of architectural and art faculty inspected the first of the reliefs set into position. While not finding fault with the work itself, they did unanimously report that the "type of panel proposed was entirely out of place in such a position on the building; and on the question as to whether the present panel is at all worthwhile as now set, six voted 'No,' and one was in doubt." Informed of their unfavorable response and the fact that work would be held up temporarily until further decisions on the matter could be made, William D. Gates, president and general manager of the terra-cotta company, caustically wrote to President Edmund Janes James, "You have a mighty fine faculty socially and educationally but they are too much for me as critics. Your Mr. White ordered work stopped some little time since. Now Mr. Green suggests submission to State Art Commission and criticizes the second panel as to whether Lincoln saw any slave sale. Now my hands are up.... Unfortunately Michael Angelo [sic], who might have been able to do this work, is not now accessible and indeed it occurs that it's possible that if he had been compelled to submit to the Art Commission before placing his work, Italy might not today have some of her art treasures.... This is the work your Architect wanted, but your Professors will have to live with it." 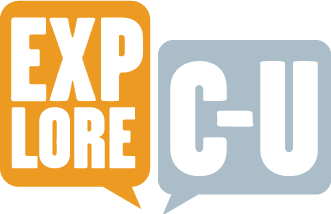 Muriel Scheinman, “The Life of Lincoln, 1911,” ExploreCU, accessed April 21, 2019, https://explorecu.org/items/show/13.